Everyone takes selfies to put on Instagram. When you start dating someone, it is only natural that you want to show off how happy you are in the relationship. You had to be jealous, happy or disgusted by everyone else’s couple photos forever, so now it is your turn to gross everyone out. 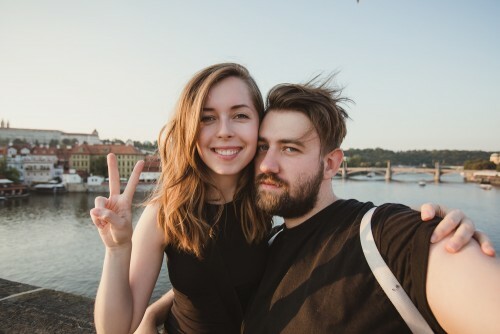 Whether you want to celebrate your new relationship or are uncertain about what ti write, these Instagram captions for couples can help. They can be used to show what you were doing last weekend, how in love you are or how great your life is going. You can use the captions as they are written, or you can modify them to suit your exact situation. If we missed any of your favorite Instagram captions for couples, make sure to leave a comment at the bottom of the article with your favorites! The first step is to think about what you want to say. Are you just expressing how you feel? Are you trying to show excitement about an upcoming event? Did your partner just give you an amazing anniversary present that you want to boast about? Before you can write a cute caption, it is a good idea to consider what you want to say. You should also keep your relationship and your own personality in mind. Our Instagram captions for couples can help you, but they need to sound genuine. If you find one that does not fit your personality, then people will quickly realize that you are not the one who wrote it. Once you have a general idea about what you want to say and have taken the perfect photo, it is time to search for the right caption! To get you started, we have compiled a list of cute, funny, sweet and romantic Instagram captions. 1. I am in love with you and all of the little things that make you, you. 2. We go together like frosting and cupcakes. 4. I fell in love with you because of the millions of small things you never realized you did. 5. I want to tie your shoes because I’d hate for you to fall for someone else. 6. You are my favorite distraction. 7. You do not love someone for their appearance, fancy car or clothes. You love them because they sing a song that only you can hear. 8. Hey, babe—I think you’re lacking vitamin me. 9. I know there are millions of fish in the sea, but you’re my Nemo. 10. Every time my phone buzzes, I check it in the hopes that it is you. 11. I love your smile anyway, but I love it more when I am the reason. 12. May I borrow a kiss? I promise that I’ll return it. 13. Life is not measured by the number of breaths you take, but by the number of moments that take your breath away. 14. They say it’s rude to stare, but I don’t care. You are too cute not to stare at. 15. I totally thought I was normal until I met you. Then, I realized we’re both weirdos and I love it. If you want a mushy, romantic Instagram caption, we have you covered. These quotes are perfect if you are in a committed relationship and head over heels in love. If you are struggling to capture that sentiment, read on. 1. You are not just my today—you are also all of my tomorrows. 2. You are my favorite refuge when my mind needs peace. 3. The key to happiness is finding the right partner. After that, nothing else matters. 4. Your arms feel more like home than my house ever has. 5. You have an amazing talent at making my heart smile. 6. I am so blessed to find the one my soul loves. 7. You never just cross my mind—you live within it. 8. What I have with you is something I never want with anyone else. 9. The best love is the type that makes you become a better person because you want to, but not because they make you. 10. By the way—I’m still wearing the smile you gave me. 11. You touched my soul, but never used your hands. I fell in love with you in that moment. 12. I love the universe because it conspired to give me you. 13. Love is friendship that has caught fire. Engulfed in flames, its brightness lights up the world. 14. I want to write the story of our life together and be with you until my last page. 15. It is amazing that someone can walk into your life and leave you wondering how you ever lived without them. 16. When you can’t look on the bright side of things, you’ll find me sitting in the dark with you. 17. You are my sun, moon and stars. 18. When I see you, my world stops and all that exists is you. 19. Forget the butterflies—I feel a zoo in my stomach when you are around! 20. I fell for you because you loved me when I was incapable of loving myself. 21. I knew I was in love when “home” became a person and not a place. 22. I wish I could turn back time, so I could find you earlier and love you longer. 23. Before I met you, I never knew that just seeing someone could make you smile. 24. Here’s to the person who enters your life from nowhere and suddenly means the entire world to you! 25. You are what dreams are made of. 27. In case you forget, I never stop thinking of you. 28. I might be too late to be your first, but I can certainly be your last. 29. Falling in love is best. Being in love is second best. Falling out of love is almost the worst. Worst of all would be to never have been in love in the first place. 30. We are shaped by those we love. 31. No one can ever know how much love a heart can hold. 32. Those we love can never be lost because, once we love them, they are forever a part of us. 33. When I read my first love story, my heart jumped and my soul sought for you. Never did I realize that I did not have to find you; you were a part of me all along. Some people love sentimental, mushy captions. If you are not one of those people, that is entirely understandable. Plus, you don’t want to go over the top with your Instagram caption if you have just started dating your partner. If you want to have fun and be silly, these captions will work. They are ideally suited for goofy couples who have a tendency to be the life of the party. If all of your Instagram pictures are ruined by bunny ears and goofy grins, these captions are perfect for you. 1. I tried to be normal once, but those were the worst five minutes of my life. 2. I came. I saw. I made things awkward. 3. If she is funny, calm, can drink, honest, has a dirty mind and eats pizza, marry her yesterday. 4. Haters gonna hate, but you taste great! 5. Everything you want in life is just a step outside your comfort zone. 6. Despite the odd advice of the 1990s, if you want to be my lover, you should not get with my friends. 7. You’d think she was a lady, but you’d be surprised—sometimes, its just a facade. Lurking beneath the mask is a dirty, old man with a drinking problem. 8. It’s weird that people tell me to be quiet when I’m loud. When I’m quiet, they ask me what’s wrong. 9. I don’t know if I have an inner child, but I definitely have an inner idiot who pops up sometimes. If you have any captions that we missed, let us know! 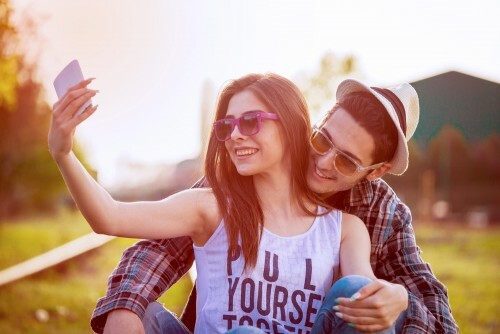 Hopefully, one of these lists will help you find the perfect caption for your couple selfies. Figure out the mood and personality that you are going for. Then, start searching through the lists to find a caption that suits your Instagram photo. Once you have the right caption, you are ready to go! Thank you for sharing your positive comment. Have a great day, Haider!